A thorough termite inspection requires the proper equipment, hands-on training and sufficient time. Focus on the task at hand. Follow a consistent, logical pattern while moving slowly enough to recognize the clues, but fast enough to get the work done. Termite inspectors are unique characters in the pest management family. They go out every day to make their living finding a pest that specializes in hiding. Every house is different, but the same. The inspectors visit homes, which typically are unprepared for inspection. When the inspection is complete and no termites are found, they wonder what they missed and hope the answer is nothing. It’s unrealistic for them to think they’ll always find termites if they’re there. On the other hand, there are steps you can take to maximize the probability of a successful inspection. A proper termite inspection can’t be done without a bright flashlight and probe, such as a screwdriver or scratch awl. Coveralls, gloves and a bump cap also are essential for inspecting crawlspaces and attics. Inspectors who are uncomfortable in their environment are less likely to stay there long enough to conduct a thorough inspection. Several pieces of equipment, including moisture meters and acoustic detection devices, offer a deeper look into a structure. Using them to inspect an entire structure, however, can take too much time. These devices are better used for problem-solving in limited areas. Veteran inspectors follow an inspection pattern to prevent them from skipping areas. Many choose to start inside and finish outside to keep from tracking dirt into the house. Whether you start at the top or bottom of the structure, it’s best to be consistent. An attic should be inspected after the rest of the interior. Most choose to inspect the crawlspace last. 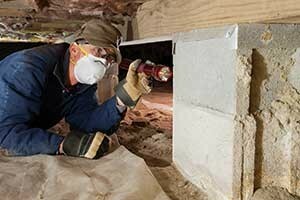 Finished basements can be daunting to a termite inspector. They must remove drop ceiling tiles and use a stepladder to gain maximum visibility. It’s painstaking and time-consuming, but a thorough inspection demands a slow, methodical trip around the basement walls. A crawlspace is arguably the most difficult area to inspect. Using knees and elbows to crawl in the dirt makes it difficult to remember inspecting for termites is the primary objective. Hazards abound. It’s important to stay vigilant for exposed wires, standing water, broken glass and other dangers. There’s no end to the stories inspectors can tell about things they’ve found in crawlspaces that are unrelated to termites. No matter what structure is inspected for termites, the best technique is taking your time. Safety should always be first. However, it’s equally important to be more concerned about what’s being inspected than how long the inspection takes.